If you’ve wandered through the newer sports and entertainment venues in the Twin Cities, or parked in recently built business and educational parking ramps, you will find helpful signs pointing the way to seats, elevators, restrooms, or where you left your car. It is easy to take this signage for granted. But showing you where to go is becoming a bustling business for Adobe DeSigns LLC, a Minneapolis enterprise owned by two Native American women. Vivian Guerra, the chief executive officer, and Lisa Owen, the controller, started Adobe DeSigns in 2014 to provide signage for building projects, either alone on modernization projects or as a subcontractor with general contractor partners on major, new construction. Some companies and institutions might contact the company directly for a project, Guerra said. More often, she added, Adobe DeSigns serves as a subcontractor for a major general construction company and often as “a third tier” supplier hired by a subcontractor to do the signage. On a visit to their South Minneapolis offices and shop in December, Guerra and Owen paused during an inter-view to meet with an architect regarding replacement signage being installed in the Target Center that is home to the Timberwolves and Lynx. This comes after their company did design, manufacturing and installment work on signage for the new Vikings stadium – US Bank Stadium – also in Minneapolis, CHS Field where the St. Paul Saints play baseball in St. Paul, and at major parking ramps throughout the Twin Cities and Duluth. Other major projects over the past two years include signage for the Brooklyn Park Library, a part of the Hennepin County Library system; Metropolitan State University facilities; various elementary and preschool (Seward Montessori) educational facilities, medical facilities and parking ramps, and Little Earth exterior signage. Three of Adobe DeSigns’ seven current employees are working at Grand Portage Lodge & Casino’s remodeling project undertaken by the Grand Portage Band of Lake Superior Chippewa, Owen said. 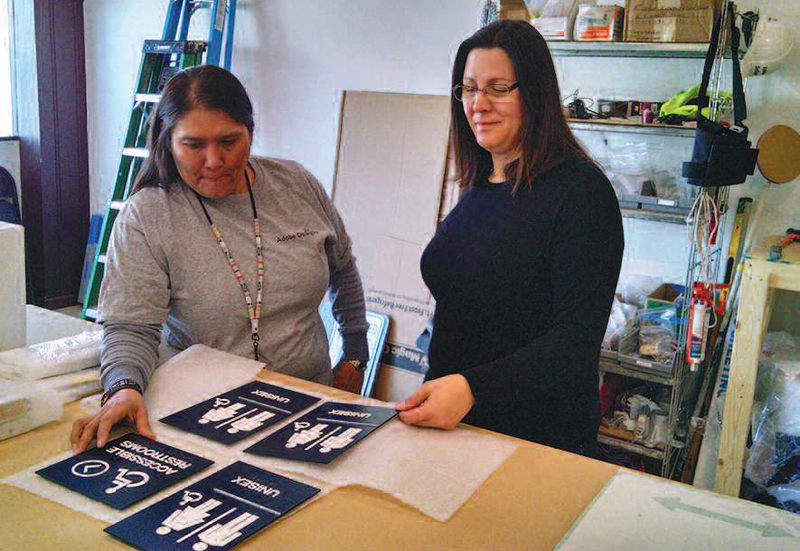 Four more employees work out of the South Minneapolis home base; most are Native American tribal members or descendants. “We are serious about minority hiring because that’s who we are and because (most) everything we do is going to require OJT (on-the-job-training),” Guerra said. A walk through of the production facilities explains why. The various signage products combine a wealth of sciences and arts including chemistry, physics, metallurgy, graphic arts, engineering design and public policy/political science about laws affecting signage. While experts are abundant in all those fields, they don’t usually come equipped across the spectrum. They may not have the manual dexterity to manufacture the standard letters, exposed neon, backlit, vinyl, sandblasted, painted, pylon, dig-ital signs and letters for both interior and exterior signage that the company makes. One of Adobe DeSigns’ strengths is in making signage using “thermoforming” technology. This is a process that uses scrap acrylic material that is heated to a pliable temperature, stretched as “film” over a mold, and then cooled to take the desired shape. These are the signs that often have Braille dots included, for the sight-impaired, that are being installed in Target Center. Guerra said these thermoformed signs may cost a little more up front but can save property owners over time because the raised information – whether letters or Braille dots – are sturdier and less susceptible to accidental chipping or vandalism. How the two owners created this unique graphic arts and manufacturing company probably follows the paths entrepreneurs have always seized. But it isn’t exactly textbook material. Guerra is a Tigua Pueblo of Ysleta del Sur in and around El Paso, Tex. That influences the company name here in the land of the Ojibwe, Dakota and Ho-Chunk peoples. Her initial intention was to live and work in Minnesota for about two years. But like others who have come and stayed, she got busy. 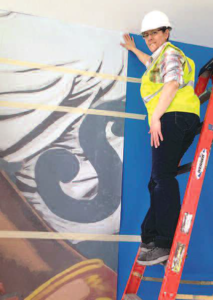 After working in a number of low-pay, unskilled jobs, she became a taper for a drywall installation company that did well for several years. Then came a recession; she was laid off, and then became entrepreneurial when her unemployment benefits were expiring. The economy recovered and Guerra was called back to work. “I asked myself if I wanted to do that again,” she said. Instead, she started her own drywall installation company. She later went to work for a sign company. That led her to start Adobe DeSigns. Owen, in contrast, is local and has traversed from public service and finance work to manufacturing. She is Flandreau Santee Dakota and traces her family’s origins back to Minneapolis, to Cloud Man’s Village on the shores of Bde Maka Ska, or Lake Calhoun, before her ancestors moved to Flandreau, S.D. In recent years, she worked in a variety of tribal and business positions involving administration and finance. She earned an Associate of Science degree in Community Development from Minneapolis Community and Technical College; a bachelor’s degree in Individualized Studies/Management from Metropolitan State University, and she had an internship with the American Indian Community Development Corporation in Minneapolis. What both women did to arrive where they are now was to identify opportunities and seize them. And they didn’t have to do everything alone. Mentors who encouraged their entrepreneurship have been an enormous help, both Guerra and Owen said. Three individuals from three different companies were especially helpful to Guerra; tribal administrators at Flandreau and educators at Metro State that helped with her individualized degree program helped Owen along the way. “I try to give back; I try to help others going into business as much as I can,” Guerra said. One way she’s helped others is with showing them a software pro-gram that identifies fixed and variable costs, expense items essential for bidding on projects to provide goods or services. Also helpful, both for learning and for sharing talents, is membership in trade associations that keep the two owners and their company in contact with people experiencing similar circumstances. These include the Minnesota American Indian Chamber of Commerce, the National Association of Minority Contractors and the Association of Women Contractors. An indication of how that plays out by encouraging entrepreneurs came within a year of Abode DeSigns’ startup. The National Association of Minority Contractors-Upper Midwest chapter honored the company and its owners with a Small Contractor of the Year award for 2015. For information about the company see: http://adobedesignsllc.com.